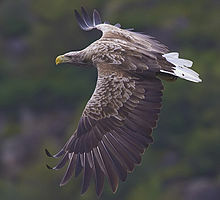 Excitement abounds just had my first sighting of a pair of White Tailed Eagles, also known as Sea Eagles … majestic raptors reintroduced to Scotland since becoming extinct. Make no mistake! these are big birds, flying barn doors. Right on the door step encircling Loch Lee and the mountain lochs, swooping silently waiting till the next meal can be snatched from the waters. Four times the size of a buzzard, two and a half metres wing span and at over one metre high; yet patience is required to see this the UK’s largest bird. House of Mark wildlife tours don’t forget your binoc’s, camera, yummy lunch /dinner if you wish….hope to see you soon.